Jourdan, wire of a surgeon, engages at 16 years, in 1778, in the Armies of the king and combat in America. On its return in France, it is reformed for disease and is established as draper. When comes the Revolution, its liberal ideas and its military past make it elect Capitaine of Hunters. He climbs the hierarchical levels and is distinguished in Belgium in 1792. July 30, 1793, it is named major general and obtains little after the command as a head of the Army of North. LE October 16 and 17, it gains the battle of Wattignies. 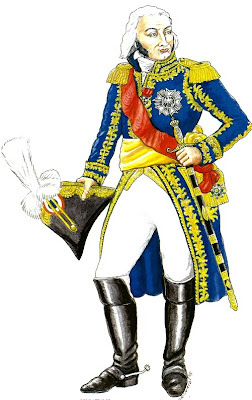 Suspect to have been opposed to the plans of the Committee of the Public Hello, it is relieved but soon recalled and placed at the head of the Army of the Moselle, March 9, 1794. After have take Dinant and Charleroi, it gain the decisive victory of Fleurus, the 26 June 1794, with head of various body which take the name of Army of Sambre-and-Meuse. It beats the Austrians on June 4, 1796 in Altenkirchen. In 1796, beaten beyond the Rhine, it is replaced by Hoche. Eread with the Council of Cinq-Cents in 1797, it makes vote on March 5, 1798 the law on the conscription which bears its name. In October 1798, it takes the command of the Army of the Danube and beats the Austrians with Stockach (March 26, 1799). But it is obliged to fold up itself and is replaced by the Masséna General. It leaves the army on April 3, 1799. In October 1799, it starts by being opposed, as a néo-Jacobin and a member of the Council of Cinq-Cents, with the coup d'etat of the 18-Brumaire. However, it joins quickly in Bonaparte. The First Consul, who wishes to be surrounded of the heroes of the Revolution, names it on July 21, 1800 ambassador in Piedmont. It is made advise of State in 1802, then senator and finally marshal in 1804. But Napoleon does not entrust to him significant stations, if not the Army of Italy in 1805.Jourdan follows Joseph Bonaparte to Naples, as governor of the city in 1806 then to Spain. It is named major-General of the Spanish Army. It takes part in the campaigns of Spain in 1808 and 1809. It controls the French Armies at the time of the battle of Vitoria (June 21, 1813). Re-entered to France, it remains in a half-disgrace. Napoleon makes it nevertheless even France during the Hundred Days and controlling as a head of the Army of the Rhine. Under the Restoration, Jourdan joins in Louis XVIII who confers the title of count to him, then in Louis-Philippe, who appoints it provisional police chief with the Foreign Affairs, finally governor of the Invalids. It dies in Paris in 1833. Jean Baptiste Jourdan. He has the classic ceremony coat of Marshall, with gold embroideries in oak leaves. Well distinguished general during the first campaigns after the Revolution and in the Consulate (Italy 1797 and 1800), he was one of first Marshalls created on May, the 19 of 1804.